I’m at Context this weekend in Columbus, and can’t wait to say hi to all the new and old friends and writer buddies and all of that. If you’re in the Columbus, Ohio area this weekend and headed to the conference, come say hi. I’ll be on five different panels this weekend, and am moderating two of them (I’ve marked with a * which ones I’m moderating). This is a great conference, with tons of good information available, lots of writers willing to help out in lots of different ways, and lots of writing professionals there to give advice and all kinds of great networking. Here it is…take a look! Thanks so much to my friend Jamie Mason for this opportunity! The deeper I get into the writing and publishing business, the more I cannot help but notice the sheer amount of networking that can open doors. And that networking happens on the internet, in emails, in critique groups…but happens on a bigger scale at conferences. I’ve been Killer Nashville three times. LOVE LOVE LOVE that conference and all the peeps who run it. You guys are AWESOME. That conference is like old home week for me. I’ve made so many friends and so many connections that I wasn’t two steps out of the elevator before I saw someone I knew this year. I didn’t go to this conference last year due to job uncertainty issues, but had been twice before, and boy oh boy did I miss everyone there. It was incredible to meet new people, to reconnect with other writers, and to, just in general, talk in depth about this crazy business that we’re all in. The last time I had been to the conference, someone had actually made a comment to me in the hallway about me knowing everyone there. I didn’t…but I knew a LOT of people. Same thing happens to me at other conferences, as well. (I mention KN a lot because I’m just a few weeks back from it, and it’s the only con I’ve been to three times). Here’s another thing….sooner or later, you start running into the same people at different conferences. And…people will help you out if they get to know you and like you. Let me give you some examples. 1) I met the writer who has generally been my sounding board, my mentor, and my cheerleader, at Killer Nashville on my first trip there. She writes under the names Jenna Bennett or Jennie Bentley. I’d signed up for a paid critique of the first chapter of what became my first published novel, THE GRIMM LEGACY. She read the entire thing for me before I started subbing it. (Don’t expect this to happen with each and every crit session you have…she and I connected, and have remained friends). 2) Jenna (to use her pseudonym) also found the MYSTERY TIMES TEN contest that published my short story, “Poltergeist on Aisle Fourteen”. This was my first paid writing credit. Seriously, I never would have seen the contest listing if she hadn’t alerted me to it. By the way, this story was also critiqued by an author at Killer Nashville. 3) My friend, Lee Lofland, who I met at Killer Nashville, gave me the opportunity to write a guest blog on being a prosecutor on his crime writing blog…after connecting and telling war stories from work over a glass of wine at the conference. 4) There’s an agent* out there who I first met (and I shared a bottle of wine with her and Lee at the Guest of Honor dinner my first year at Killer Nashville), who I’ve met now at four different conferences. We ended up on a panel together last spring at a different conference…and ended up having a long conversation about book marketing and promotion before we spoke on the panel together (at MARCON). I can’t wait to see what conferences I might see her at down the road. I always enjoy talking with her. 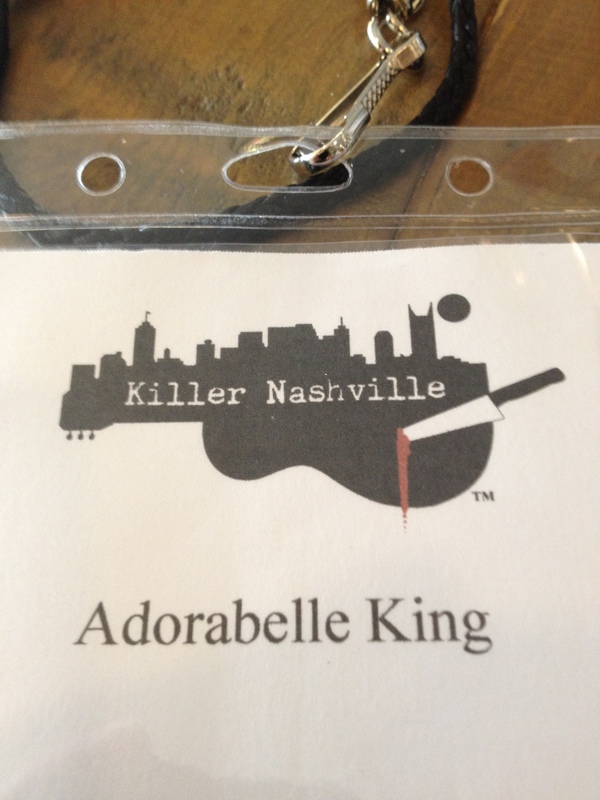 5) My friend Kay Elam was all but pitching my work for me to an agent* that was at Killer Nashville this year when she learned that I had a roundtable session with that agent, and then helped to connect me to that agent for a long and very interesting discussion. You rock, Kay. I also spoke to an editor* that I’d met at the conference before who remembered me from before, and the discussions we’d had about panels and publishing and professionalism and plot and submissions. 6) I met my friend, Steven Saus, at Gen Con in Indianapolis in 2008, only to find out later that he lived only a couple of miles down the road from where I lived when I was in Dayton. Steven and I have talked now at multiple conferences, and, through that connection, I got an invitation to write “Building Believable Legal Systems in Science Fiction and Fantasy” which just came out in EIGHTH DAY GENESIS; A WORLDBUILDING CODEX FOR WRITERS AND CREATIVES this past summer. 7) By knowing Steven, I’ve gotten to know Jean Rabe and Kelly Swails. Jean got me on panels at Origins this year, and Kelly’s running the writer’s agenda next year. These two are soooooooo wonderful…wonderful writers and wonderful people. I love working with both of them and can’t wait for Origins next year. 8) A couple of years ago, I met Celina Summers, the managing editor for Musa Publishing, at RT when it was in Columbus, Ohio. Celina and I are both members on the Absolute Write Water Cooler boards, and we ended up having breakfast at the conference. It’s Celina that offered me the contract to write the sequel to THE GRIMM LEGACY…the book I’m working on right now. It’s possible we run into each other at another conference down the road. I sincerely hope so. HOWEVER, the Grimm book was barely a seed of a thought in the back of my head at the time we had that breakfast. 9) Some of the blog interviews I’ve done for promotion on the novel were with people I’ve met at conferences; Red Tash (Novels in Progress), and Jenna Bennett (Killer Nashville). I’ve also been talking with Jamie Mason (Killer Nashville) about her writing blog, Author Scoop. Hoping to have more information on this down the road. 10) By going to conferences, I’ve gotten to have breakfast with Christie Ridgeway, lunch with Debbie Macomber, drew chickens on the lounge message board with Julie Kagawa, listened to Michael Stackpole talk about organizing a conference, stayed up late talking publishing with Julianne Lee, shared wine and good music with another agent*, hung out in the bar with Elizabeth Vaughan talking publishing and law (we’re both lawyers), and was able to have a coherent conversation with Patrick Rothfuss without devolving into a puddle of fangirl squee. These are experiences that cannot be replicated, well, ever. And it’s only the tip of the iceberg. Here’s the rub…those are just the things that came to my head just now. I’ve been going to cons and networking like a mad fool for six years. There’s a million and one other stories about going to cons. There’s a bunch of stories about inside jokes at certain cons, about craziness and critiquing and sharing tips and leads and pitching and panels. We’re coming up on the end of this year’s conference season. I cannot stress enough just how much I’ve gained from going. It’s almost unheard of to walk away from a conference with an agent or a publishing contract. If you’re trying to decide whether it’s worth it or not to go to one, understand that fact before you make any arrangements. Know what you’re going for, and what you can realistically expect. Understand that getting to know people is a good thing…and being professional, easy to talk to, and willing to learn are the most valuable skills you can have as you set out to start on the writing path. *I’ve listed names of people if I either 1) have an already existing professional relationship with them, 2) they are friends, 3) the interaction I’ve mentioned is just about happenings at a con rather than about writing and/or publishing, or 4) any combination of 1), 2), or 3). I’ve mentioned some interactions with publishing professionals (agents, editor) to show the power of networking, but because I do not yet have an already existing professional relationship with them, I prefer not to say on the blog who they are or who they might be. I do not currently have an agent. They may or may not recognize themselves in these stories if they see this blog, but I’m talking about networking, not about my specific relationship or lack thereof with any of them, so I’ve left them anonymous, so as not to put any of them on the spot.